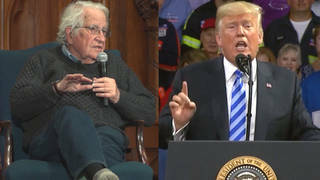 Noam Chomsky on Reagan’s Legacy: Bush Has Resurrected “The Most Extremist, Arrogant, Violent and Dangerous Elements” of Reagan’s White House | Democracy Now! DEMOCRACY NOW–The network and newspaper coverage of the death of Ronald Reagan has brought forth a chorus of praise from Democrats and Republicans alike. Much of the reporting and commentary, under the guise of respecting the dead, has represented a dramatic rewriting of the history of the Reagan years in office. NOAM CHOMSKY: That’s quite true. The Reagan administration is either the same people or their immediate mentors for the most part. I think one can say that the current administration is a selection of the more extremist and arrogant and violent and dangerous elements of the Reagan administration. So on things like–I mean, that is true on domestic and international policy they are, both in the Reagan years and now, they are committed to dismantling the components of the government that serve the general population — social security, public schools and so on and so forth, but in a more extreme fashion now. Partly because they think they have achieved a sort of higher stage from which to launch the attack, and internationally it’s pretty obvious. In fact, many of the older Reaganites and Bush, number one people have been concerned, even appalled by the extremism of the current administration in the international domain. That’s why there was unprecedented elite criticism of the national security strategy and the implementation in Iraq–narrow criticism, but significant. So, yes, they’re there, in fact, you cannot — some of the examples are remarkable, including the ones that you mentioned. And very timely they picked Negroponte, who of course has just been appointed, the new ambassador to Iraq where he will head the biggest diplomatic mission in the world. The pretense is that we need this huge diplomatic mission to transfer full sovereignty to Iraqis and that’s so close to self-contradiction that you have to admire commentators who sort of pretend not to notice what it means, also to overlook, consciously, what his role was in the Reagan administration. He also provided — he was an ambassador in the Reagan years, ambassador to Honduras where he presided over the biggest C.I.A. station in the world, and the second largest embassy in Latin America, not because Honduras was of any particular significance to the U.S., but because he was responsible for supervising the bases from which the U.S. mercenary army was attacking in Nicaragua, and which ended up practically destroying it. By now, Nicaragua is lucky to survive a few generations. That was one part of the massive international terrorist campaign that the Reaganites carried out in the 1980’s under the pretense they were fighting a war on terror. They declared a war on terror in 1981 with pretty much the same rhetoric that they used when they re-declared it in September 2001. It was a murderous terrorist war. It devastated Central America, had horrendous effects elsewhere in the world. In the case of Nicaragua, it was so extreme that they were condemned by the World Court, by two supporting Security Council Resolutions that the U.S. had to veto, after which, of course, they rejected the court judgment and then escalated the war to the point where finally the effects were extraordinary. By the analysis of their own specialists, the per capita deaths in Nicaragua would be comparable to about 2.5 million in the United States, which as they have pointed out is greater than the total number of casualties in all U.S. wars, including the Civil War and all wars in the 20th century, and what’s left of the society is a wreck. Since the U.S. took over again, it’s gone even more downhill. Now the second poorest in the hemisphere after Haiti and not coincidentally, the second major target of U.S. intervention in the 20th century after Haiti, which is first. The recent health administration statistics show that about 60% of children under two are suffering from severe anemia caused by malnutrition and probable brain damage. Costa Rica, the United States is trying to–doing enough low-level work so that they can send back some remittances to keep the families alive. It’s a real victory. You can understand why Colin Powell and others are so proud of it. But Negroponte was charge of it in the first half the decade directly, and in the second half more indirectly in the State Department and National Security staff where he was Powell’s adviser. And now he is — he is supposed to undertake the same role and similar role in Iraq. He was called in Nicaragua “The Proconsul,” and the “Wall Street Journal” was honest enough to run an article in which they headlined “Modern Proconsul” on which they mentioned his background in Nicaragua without going into it much and said, yes he will be the proconsul of Iraq. Now, that’s a direct continuity, but there’s a lot more than that. What you mentioned is correct. Elliot Abrams is an extreme case. I mean, he’s now the head of the Middle East section of the National Security Council. He was — as you know, he was sentenced for lying to Congress. He got a presidential pardon, but he was one of the most — he was in charge in the State Department of the Central American atrocities, and on the Middle East, he is way out at the extreme end of the spectrum. This does reflect the — in a way the continuity of policies, but also the shift towards extremism within that continuity. NOAM CHOMSKY: That’s correct. Casteneda is being diplomatic. He’s understating with regard to the international law and with regard to the intervention. It was–it ended up with a couple hundred thousand people being killed and four countries ruined. And even the world–the US–the people now in office in Washington have the unique honor of being the only ones in the world who have been condemned by the World Court for international terrorism. That’s a little more than what he said, but that’s what he’s aiming at. The unpopularity continues. The latest figures show that this George Bush, number two, latest Latin American figures, among Latin American elites, the ones who tend to be more supportive of the United States, I think it was about close to 90% opposition throughout the hemisphere and approximately, if I remember, 98% opposition to him in Mexico. But to be accurate, we should say that this goes way back. So, John F. Kennedy was — tried very hard to get Mexico to line up in his anti-Cuba crusade. A famous comment by a Mexican foreign minister when Kennedy tried to convince him that Cuba was to join in the terrorist war against Cuba and the economic embargo strangulation, in fact on the grounds that Cuba was a threat to the security of the hemisphere and the Mexican ambassador said he had to decline, the prime minister had to decline because if he tried to tell people in Mexico that Cuba was a security threat, 40 million Mexicans would die laughing, which is approximately the right answer. Here not so. The one point on which I think Casteneda’s comment that you quote is really misleading is when he refers to cold war thinking and rivalries. There were no Russians in Latin America. In fact, the U.S. was trying very hard to bring them in. Take, say, Nicaragua, when the terrorist war against Nicaragua really took off, Nicaragua tried to get some military aid to defend itself. And they went first to European countries, France, others. The Reagan administration put extreme pressure on them not to send military aid because they were desperately eager for Nicaragua to get military aid from Russia or indirectly through Cuba. So they could then present it as a cold war issue. Nicaragua didn’t fall into the trap as Guatemala had in 1954, basically the same scenario. So, they didn’t get jet planes from Russia to defend their airspace against the U.S. attacks. They had every right to do it, but the responsibility to do it, but they understood the consequences. So, the Reagan administration had to float constant stories about how Nicaragua was getting MIG jets from Russia in order to try to create a cold war conflict. Actually it’s very revealing to see the reaction here to those stories. Of course, Nicaragua had every right to do it. The C.I.A. had complete control over Nicaragua’s airspace and was using it. It was using it to send communications to the guerrilla army, which was — guerrilla is a funny word for it, computers and helicopters and so on to send them instructions so that they could follow the U.S. command orders to avoid the Sandinista army, the Nicaraguan army and to attack what are called soft targets, undefended civilian targets. It’s a country that doesn’t have a right to defend its airspace to protect that, I don’t know what you can say. So obviously, they are a right to do it, but they didn’t. They allowed the U.S. to have control of the airspace and to attack — to use it to attack undefended targets. NOAM CHOMSKY: Yes, the mining of the harbors. They decided to — they asked a legal team headed by a very distinguished American international lawyer, A. Chayes, professor of law at Harvard who had long government service, and that legal team decided to construct an extremely narrow case. So, they kept to matters that were totally uncontroversial, as the U.S. conceded like the mining of the harbors, but it was only a toothpick on a mountain. They picked the narrowest point in the hope that they could get a judgment from the World Court, which would lead the United States to back off from the whole international terrorist campaign, and they did win a judgment from the court, which ordered the U.S. to terminate any actions, any violent actions against Nicaragua, which went way beyond mining of the harbors. That was the least of it. So, yes, that was the narrow content of the court decision, although, if you read the decision, the court decision that goes well beyond, they’re all conscious of the much wider terrorist campaign, but the Harvard–the Chayes run legal team didn’t bring it up for good reasons. Because they didn’t want any controversy at the court hearings about the facts. There was no controversy about that, since it was conceded. However, it should be read as a much broader indictment, and a very important one. I mean, the term that was used by the court was “unlawful use of force,” which is the technical term for the informal notion, international terrorism. There’s no legal definition of international terrorism in the international domain. So I bet it was in effect a condemnation of international terrorism over a much broader domain. However, we should bare in mind, it’s important for us, that horrible as the Nicaragua war was, it wasn’t the worst. Guatemala and El Salvador were worse. I suggest that in Nicaragua, the reason was that in Nicaragua, the population at least had an army to defend it. In El Salvador and Guatemala, the terrorist forces attacking the population were the army and the other security forces. There was no one to bring a case to the World Court that can be brought by governments, not by peasants being slaughtered.